- Save up to 40% on Gibson Exhausts!! Click HERE to shop now! If you’re looking for the best in cargo area protection that not only is high quality, but also both fits and looks great, the VanTred Van Cargo Area Liner by BedRug is the perfect solution for you. Van Tred gives you the look and feel of a spray in liner, but with increased durability, better UV Protection (no fading), and it can be removed fast and easily if desired. Each VanTred Liner is made specifically for your make and model of van. This means that VanTred Liners will match the contour of your Van exactly. You’ll be left with a textured non-skid surface and maintain the exact shape and features of your cargo area. The VanTred by BedRug is made of 1/2" TPO composite bonded to a layer of water proof, closed-cell foam. 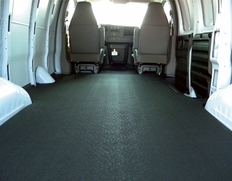 VanTred offers ultimate van cargo area protection and is resistant to staining, bleach, oil, and even battery acid! VanTred will not absorb water and is impact absorbent, meaning it is easy on your knees, and your cargo. VanTred by BedRug not only looks good out of the box, it stays looking great. VanTred can be easily cleaned whenever you wash or clean the rest of your Van. It can be vacuumed or washed with a hose. The VanTred Cargo Liner by BedRug installs in only minutes without any automotive knowledge. You’ll be able to easily install VanTred yourself and you can remove it just as easily. Once your VanTred is installed, it is backed by a lifetime warranty. The part number for this item is VTRF92X and it fits 1992-2014 Ford E Series Van (Extended Size) models. "I came to your store in person and the service was great." Join today and receive all the latest news, event updates and promotional offers. Copyright © 2001-2019 New Level Motor Sports Inc. All rights reserved.